We're cramming everything this week into three days, so tomorrow instead of our usual correspondence bloggers ("guest" doesn't really fit for Claire Youmans or Amy Echeverri when they're part of the team) we're going to be putting up a couple of posts that should have gone up on Monday and Tuesday. Also, Claire's next article is about NaNo, and I figured I would nudge it a bit closer to November if possible. W.A.W. isn't making enough for me to pay anyone up front (yet), and I make no money from ad revenue. If I ever do make money enough to pay authors, and/or your article brings in heavy traffic, we will figure something out so I'm not taking the hard work of a writer with nothing but the promise of "exposure." 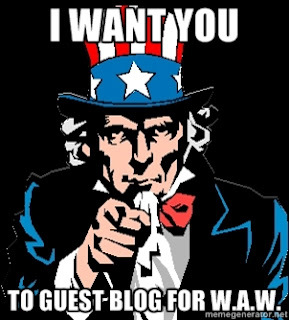 It might not be more than a dollar or two for a solid article or a few bucks for something quite viral, but I will pay something if your article does better than an typical article here on W.A.W. (about 150-200 page views). Plus of course if someone sends me a donation earmarked for a guest blogger, I will pass the money onto them and even cover the Paypal fee–that's for them, not me. It may not add up to much (unless you get millions of hits or write for me a lot) but if it came from your work, I'll make sure I'm not taking advantage of you.